I was thrilled when I first heard that Clare Vanderpool was going to have another middle-grade novel published this year. Thrilled, but also anxious. You see, I absolutely loved Moon Over Manifest (Vanderpool’s first book and the winner of the Newbery Medal in 2011), and anytime I love something, I hold onto it protectively, daring anything or anyone to try to change my devotion. 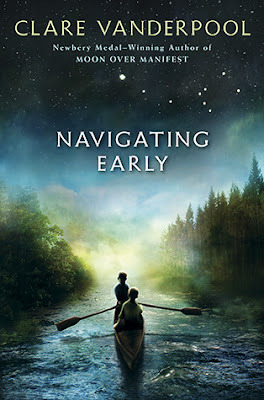 I was worried that Navigating Early wouldn’t be as good (Moon Over Manifest would be a hard one to match), and I didn’t want my esteem to falter simply because of an average second novel. When the story begins, World War II has just ended. Jack Baker has long been anticipating the return of his father, a naval captain, but the unexpected death of Jack’s mother makes the reunion more bitter than sweet. Unable to handle his own grief, let alone his son’s, Jack’s father ships him off to a boarding school in Maine--a far cry from his native, comfortable, well-known Kansas. Jack is soon befriended by Early Auden, that “strangest of boys,” who sorts jelly beans when he is upset, listens to Billie Holiday when it’s raining, and is obsessed with the number pi. During a week-long school break, the two boys leave the empty school and set out on a quest. Using pi as a guide, they discover that things are not always as they seem and that there is always more than one way to look at a problem. After I finished Navigating Early, I told Mike, “You have got to listen to this book!” I wasn’t sure if he’d like it since he doesn’t love children’s lit the same way I do, but I figured since it involved the number pi, it wouldn’t be completely unbearable for his mathematical brain. One of first things he mentioned after finishing it (and he did like it, btw) was that it reminded him a lot of Holes by Louis Sachar (not the subject matter or plot, but the pacing and structure). Interestingly, I made the same comparison about Moon Over Manifest back when I reviewed it in 2011. In these examples, both Sachar and Vanderpool weave two contrasting plot lines together, and I think it was this similarity that Mike and I both noticed. In Navigating Early, the story flips back and forth between Jack and Early’s adventures and a tale Early has created to go along with the numbers that make up pi. Early's tale bears an eerie resemblance to what is actually happening to the two boys, and Early uses the story to help guide them through the woods. I thought it was extremely clever the way the Story of Pi influenced and manifested itself in the real plot. It would be difficult to describe just how much I loved Early Auden, that “strangest of boys” (a term of endearment if ever there was one). He has some kind of high functioning autism spectrum disorder, and he is absolutely brilliant. I’d be interested to hear what other people who spend a lot of time around autistic kids think about this book. For me, and from my very limited exposure, it hit the nail directly on the head. (Early would probably take that phrase literally.) Early was so real to me. Now that I’m done, I keep catching myself wanting to talk about him to other people...like he’s an actual boy in my neighborhood or family. Listening to him talk (and narrator Robbie Daymond really brought him to life), I felt like I was talking to the people I really do know who have Asperger’s. I loved the definitive way he argued and how everything was so stark and organized. I loved his little obsessions (pi, his brother Fischer, the great black bear, and music). In short, Early made the book for me. Speaking of Early, I think the title is so clever because it can be interpreted so many ways, and all of them are correct: much of the book focuses on Jackie navigating his relationship with Early, which is a bit rocky at times; the two boys are also physically navigating wild and dangerous territory; Jack’s father is a captain of a ship, so he’s had first-hand experience with an actual navigator. Both words are just great metaphors and descriptors for what the novel is about. And that cover? Gorgeous, don’t you think? I try not to read reviews before I finish a book and have written my own review of it. But after I’m done, I sometimes like to read a few, and I always read the negative ones with great interest. But this time, I am terrified to read anything bad or uncomplimentary about it. Within the last few weeks, I have developed such a strong attachment toward this novel that I shudder to think of anyone not liking it. I honestly haven’t heard it getting much Newbery attention at all (but maybe I’m just not reading the right things? ), and that baffles me because it seems like a perfect candidate for the Newbery. I remember how much I loved Wonder last year, and then I started reading about why people thought it didn’t deserve the Newbery, and once they’d been pointed out, I could recognize and acknowledge its flaws for sure, but I still loved it. I guess I’m worried that something similar will happen in this case, and I don’t want to have to defend it . . . not because it’s not worthy of being defended, but because it was so well done, it shouldn’t have to be defended. But now I’m really going off on a tangent . . . I think this quote from Jackie's mom perfectly sums up what the book is about and why I liked it so much: "You have to look for the things that connect us all--find the ways our paths cross, our lives intersect, and our hearts collide.” That’s what Early and Jackie did in the book, and that’s what I want to do in my own life. Putting this on my To Read list. Thanks! I loved this book! I'm glad you recommended it. It was the perfect book to read on vacation in the 'wild'. Loved listening to this --Thanks so much for the recommendation. I am so glad! Thanks for telling me!